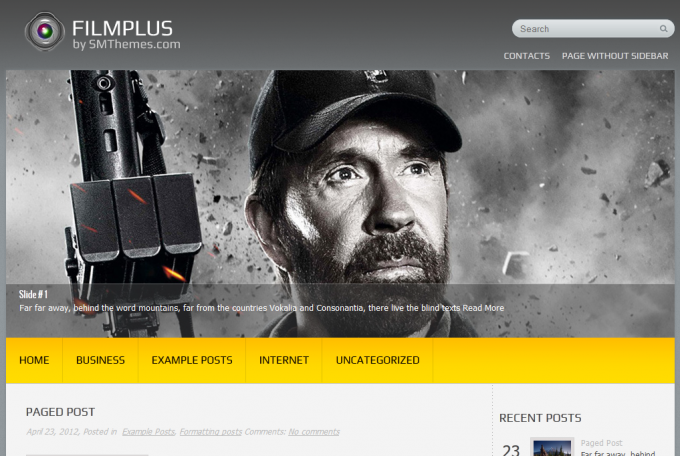 ‘FilmPlus’ is a stunning WordPress theme, designed especially for cinema fans. It draws attention with the nice combination of grey, white and yellow. The neat and simple layout of the theme puts the focus on the content of your site; therefore don’t hesitate to use all your imagination and creativity to arrange every post to be unique and memorable. ‘FilmPlus’ provides a lot of customizable options, like custom menus, custom colors, custom widgets, custom sidebars etc. It comes to you slider ready and equipped with translation options. The theme is mobile friendly. It adapts easily to all displays with different screen resolutions, from smartphones to big HD TVs. It is friendly for the social media with many options to share the content on the social networks via special icons and buttons integrated in ‘FilmPlus’.